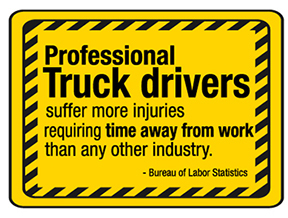 According to the Bureau of Labor Statistics, professional truck drivers suffer more injuries requiring time away from work than any other industry. This is a trend that has continued for over a decade. Per OSHA, manual materials handling is the main cause of compensable injuries in the American work force, with four out of five of these injuries affecting the lower back. In 2013, there were 212,080 cases involving injuries to the back. These cases include sprains, strains, and tears; bruises and contusions; fractures; and soreness and pain in general. These statistics, coupled with the fact that nearly 25% of all warehouse injuries occur at loading docks, highlight the importance of implementing and enforcing safe lifting practices in the workplace for professional truck drivers and warehouse employees. Improper lifting, twisting, or bending can strain or sprain the back, cause ruptured or slipped disks, muscle spasms, and other pain. Back disorders can develop over time due to repetitive motions, or they can be triggered by a single movement or accident. Vibration, such as with lift truck drivers, delivery drivers, etc. While protecting workers from back injuries does not fall under any one particular standard, OSHA points to the General Duty Clause, Section 5(a)(1) of the OSH Act of 1970, which requires employers to provide their employees with a workplace free from recognized hazards likely to cause death or serious physical harm. This DVD will help you educate your employees on how to keep their backs healthy and provide preventive measures that can be taken to avoid back injuries. This DVD covers the safety issues unique to drivers, loading dock workers, and warehouse employees. Includes topics such as: back injuries resulting from improper lifting or carrying; using forklifts; and preventing slips and falls caused by wet or oily docks. This industry-specific DVD teaches drivers how to stay injury-free while performing non-driving tasks. Covers best practices for preventing back injuries, avoiding sprains, cuts, pinches, abrasions and cuts, and avoiding becoming pinned or crushed by cargo. With RyderFleetProducts.com, you have instant access to the trucking industry’s premiere aftermarket parts and shop supplies – all at discounted prices. This entry was posted in Uncategorized by Ryder Fleet Products. Bookmark the permalink.